Interest rate swaps trade duration risk across developed and emerging markets. Since 2000 fixed rate receivers have posted positive returns in 26 of 27 markets. Returns have been positively correlated across virtually all countries, even though low yield swaps correlated negatively with global equities and high-yield swaps positively. IRS returns have posted fat tails in all markets, i.e. a greater proclivity to outliers than would be expected from a normal distribution. 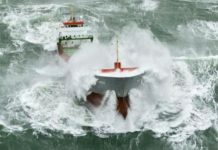 Active volatility management failed to contain extreme returns. Relative IRS positions across countries can be calibrated based on estimated relative standard deviations and allow setting up more country-specific trades. However, such relative IRS positions have even fatter tails and carry more directional risk. Regression-based hedging goes a long way in reducing directionality, even if risk correlations are circumstantial rather than structural. Interest rate swaps (IRS) are contracts that exchange one stream of periodic interest payments for another for a specific length of time. 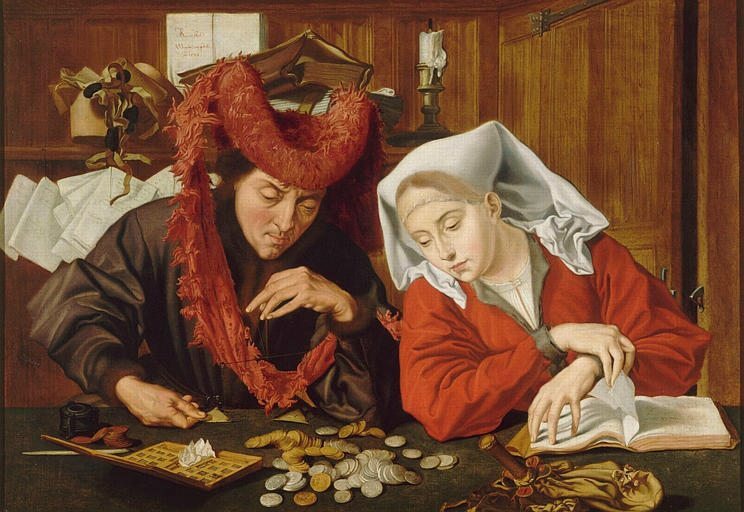 IRS are over-the-counter derivatives between two parties. The predominant ‘vanilla’ interest rate swaps exchange fixed-rate payments for floating-rate payments, with the latter being determined by a short-term rate such as the local interbank rate. The fixed-rate payment is called ‘swap rate’. 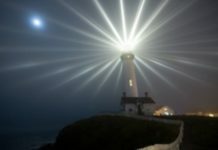 The conventional view is that it reflects the market’s expectation of the time path of the floating short rate plus a term premium that can be positive or negative. 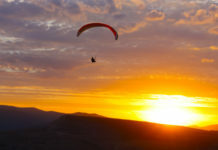 Unlike bonds, swaps do not involve default risk on the notional for the tenor of the contract. 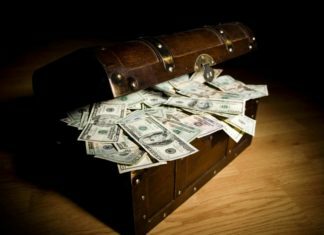 However, the swap rate does include some credit spread for short-term unsecured bank lending as implied in the floating leg and, depending on market conditions and direction, it may also include a premium for collateral risk and balance sheet costs. Liquid standard IRS markets operate for developed markets but not for all major EM currencies. In some cases, investors prefer taking positions in non-deliverable swaps or cross-currency swaps instead. In the case of non-deliverable interest rate swaps parties agree to exchange a floating interest rate for a fixed interest rate in the emerging market currency, as in a standard IRS, but he contract is cash settled in US dollars and operates out of reach of the local regulator. Cross-currency swaps exchange period payments in a major currency versus payments in a minor currency. The minor currency is typically non-convertible, thinly-traded or subject to exchange restrictions and denominates the fixed leg of the swap. The swap discounts future cash flows for both legs at the market interest rate applicable at that time. 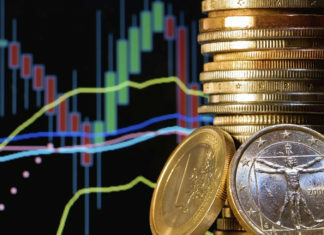 The sum of the cash flows denoted in the foreign currency is converted with the spot rate. Beyond this the cross-currency swap always involves an exchange of notional. The physical exchange of the currency amounts occurs on the start and end dates of contract at the spot exchange rate. This exchange eliminates the exchange rate risk in the contract. The cross-currency swap curve of the local (EM) currency consists of two parts the local interest rate curve and the basis spread curve. This basis spread curve represents ‘compensation’ for differences between local interest rate spreads and FX forward-implied carry. Before the global credit crisis this spread was close to zero. Nowadays, the spread ranges mostly between 20 and 40 bps. It tends to be higher on the short end of the curve. The empirical analysis of swap returns has been based on a panel of 10 developed market currencies and 17 emerging market currencies. Data for the developed IRS markets have been analysed from 2000 to February 2018. 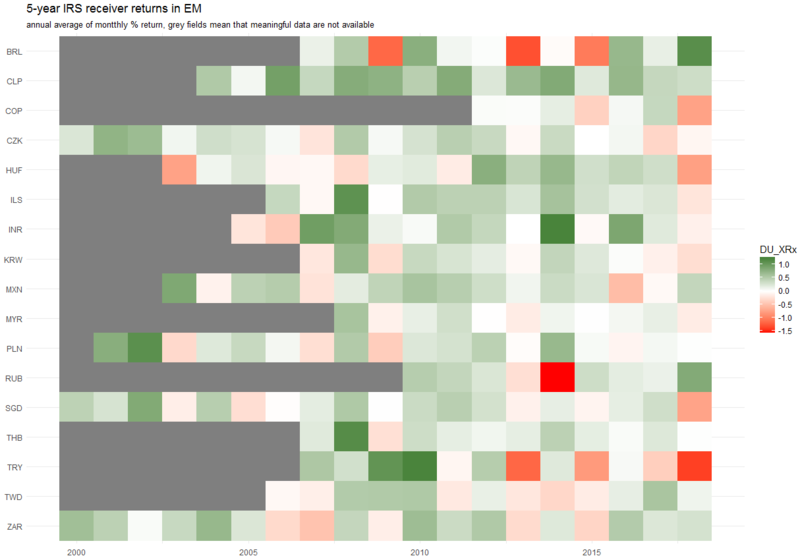 Data for EM swap markets have been analyzed from 2000 for four currencies (CZK, PLN, SGD and ZAR) and from later start dates (mostly between 2002 and 2005) for the other currencies due to liquidity and data limitations. RUB (2009) and COP (2012) enter the sample very late. The total return of an IRS consists of three components, namely, return from actual market price changes, return from ‘rolldown’ of the curve, i.e. 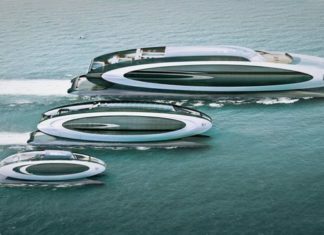 the shortening of maturity) and return from differential between fixed and floating leg yield. The composite of price and roll returns return is calculated as the change in the fixed-leg yield times the swap’s modified duration. Since 2000, the average monthly duration return of a 5-year IRS receiver relative to its notional has been 19 bps or roughly 2.3% annualized. Each and every market has posted a positive average return since 1999 or the individual date of tradability with the exception of Brazil. The average monthly standard deviation has been 126bps, ranging from 45bps in CHF to 273bps in BRL. Long-terms cumulative returns on IRS receivers in almost all markets since 2000 have been positive. Also, the pattern of return accumulation overtime has been similar across most countries, particularly in the developed world, with the greatest gains being recorded in the wake of financial crises. As business cycles become more mature duration returns have a tendency to flatten. 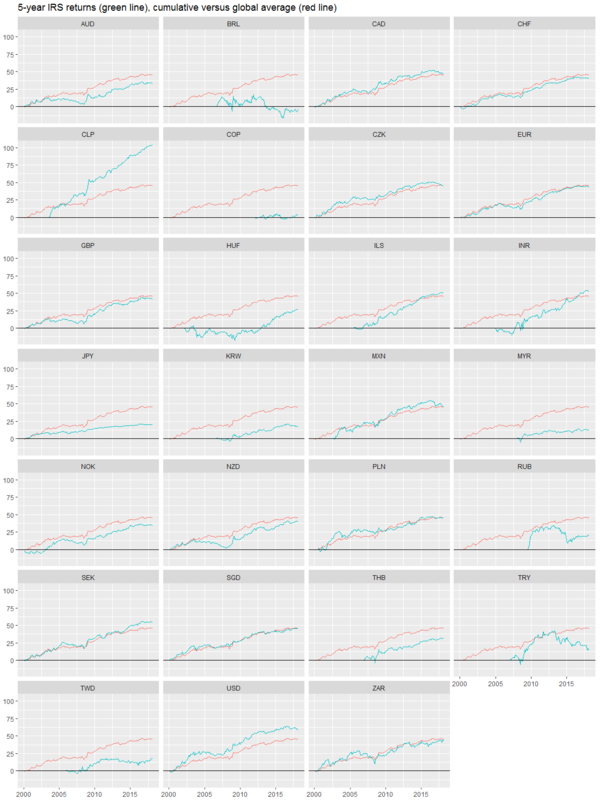 Chile, the U.S. and Sweden posted the highest long-term returns. The high-yield countries Brazil and Turkey posted the lowest long-term duration returns. Annual performances of developed market IRS receivers indicate that individual markets rarely buck the global trend. In years of pronounced rates rallies, such as 2002, 2008, and 2010-2012 not a single developed market posted a negative return. Years of generally rising yields (2006-07, 2013) have in the past been precursors to USD funding stress. Annual performances of EM IRS markets have also mostly been in synch with the DM trends. For example, only Hungary and Taiwan posted a negative annual return during the 2010-2012 rally. 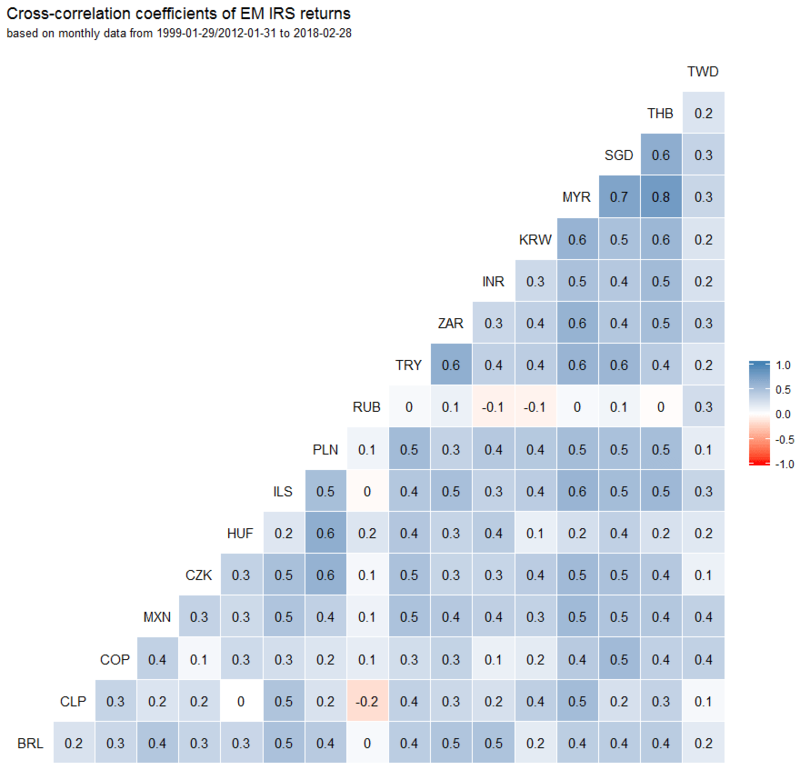 However, on the whole EM performance has been a bit more diverse. There have been occasional extreme outliers, particularly in Brazil, Russia and Turkey. The period 2013-2015 witnessed both sizeable annual gains and losses for EM IRS markets within the same year. There has been a clear long-term positive correlation between IRS carry (fixed-variable rate spread plus curve rolldown) and total return. This holds for the full sample period and the 2000s and 2010s separately. Thus, Chile was the IRS market with the highest carry and the highest long-term return, whereas Brazil was the IRS market with the lowest carry and the lowest long-term return. All interest rate swap markets displayed fat tails relative to a normal distribution since 2000, with an average excess kurtosis coefficient of 2.6. The heaviest tails were to be found in Asia, particularly in India, Japan and Thailand. Another indication of the markets’ proclivity to outliers is the interquartile range or midspread that contains the 50% smallest absolute monthly returns, which has been just 131bps, whereas the average maximum and minimum returns across countries have been 509bps and -437bps respectively. 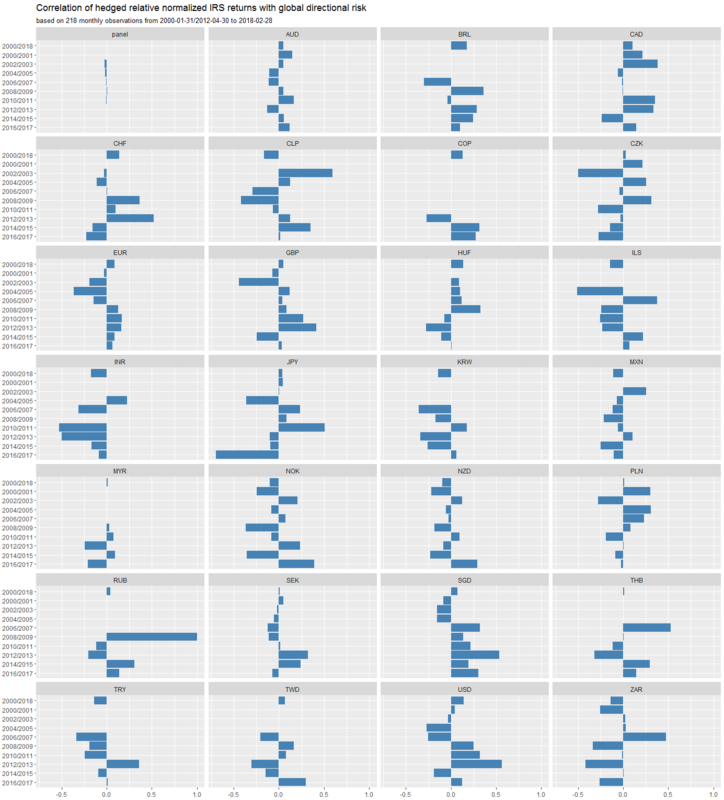 The below box-whisker chart of inner and outer ranges across currencies plots outliers as blue dots. 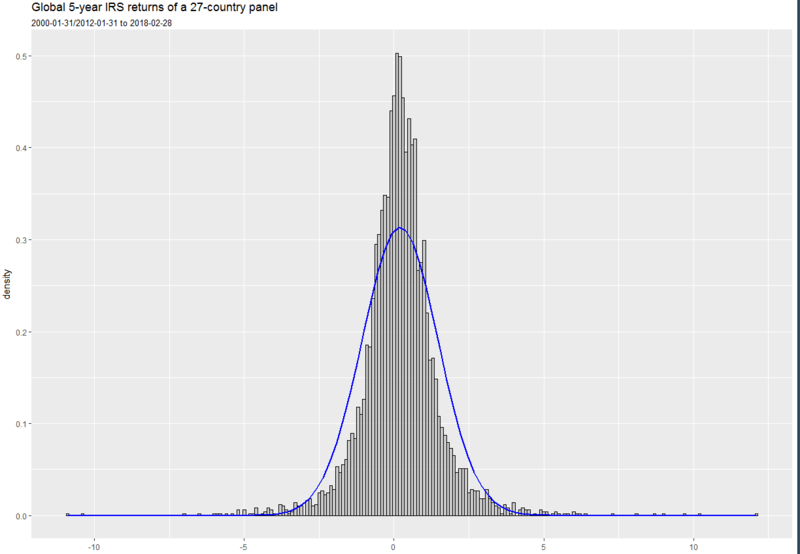 In terms of a global panel of IRS returns across countries, a histogram suggests that absolute monthly returns of less than 1% and over 4% have been overrepresented relative to the normal distribution. 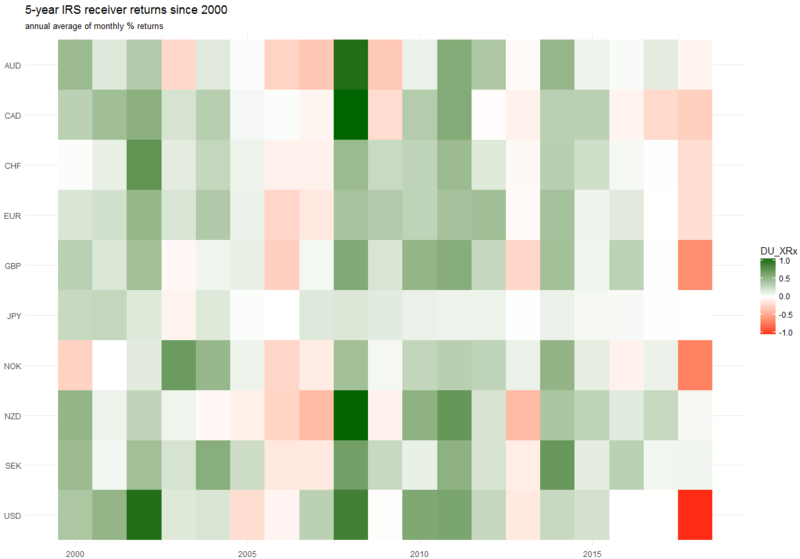 Based on monthly returns, all developed market IRS returns have been positively cross-correlated, with coefficients mostly between 50% and 80%. Particularly high correlation was recorded between EUR and its European neighbours (CHF, SEK, GBP), between the U.S. and Canada, and between Australia and New Zealand. The least correlated developed market has been Japan. 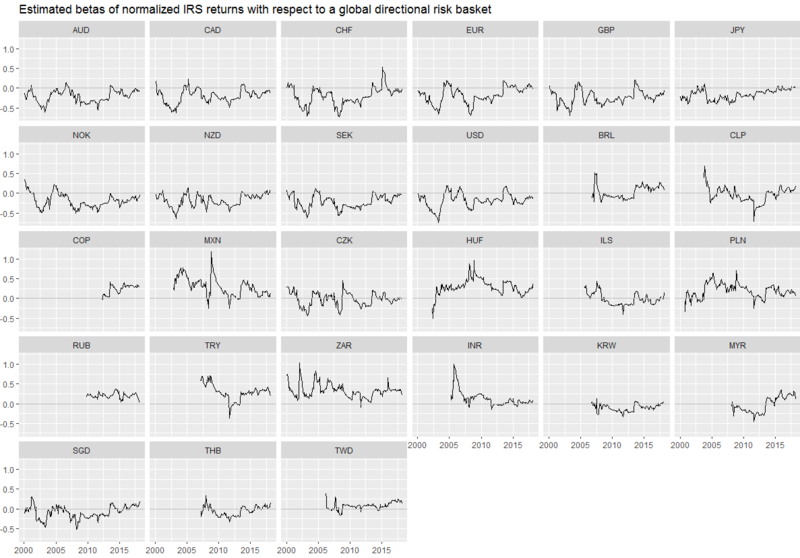 Average correlation of developed market IRS returns with global benchmarks has been fairly similar across countries. 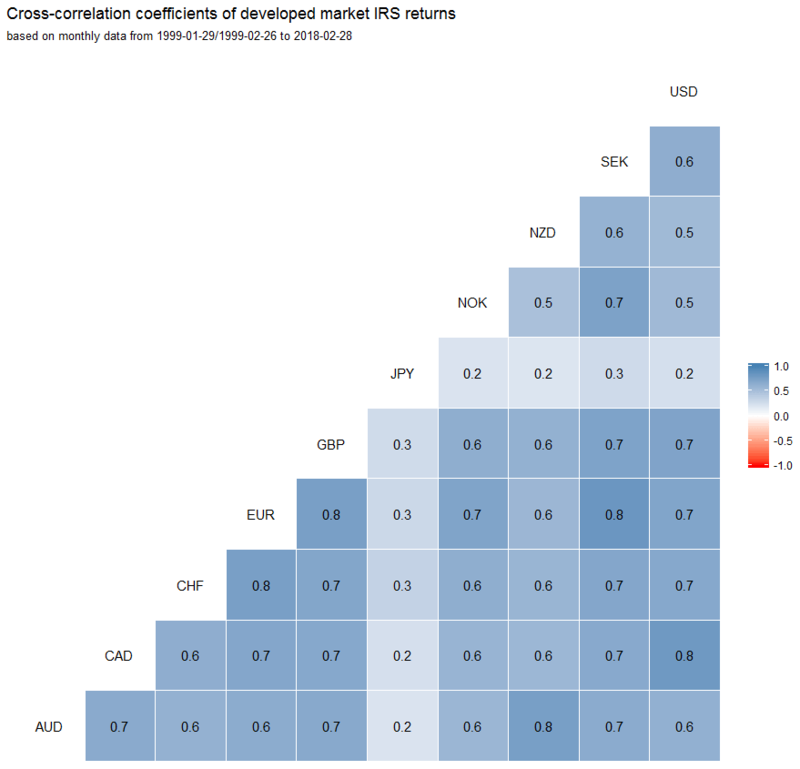 Correlation with G2 swap markets (USD_DU_XRx, EUR_DU_XRx) has been strongly positive, correlation with a global directional risk basket (GLB_DRB_XR) and G2 equity markets (USD_EQ_XR, EUR_EQ_XR, EUR_FX_XR) has been strongly negative. Correlation with EURUSD returns has been small and sporadic. Within the G2, duration-risk correlation has likewise been negative. EURUSD has been positively correlated with USD IRS returns and negatively with EUR IRS returns. In the 2000s and 2010s financial cycles so far risk expansion has been associated with higher yields and a weaker USD. Selloffs have been associated with lower IRS yields and a stronger USD. This apparently reflects the prevalence of deflationary shocks and USD funding. 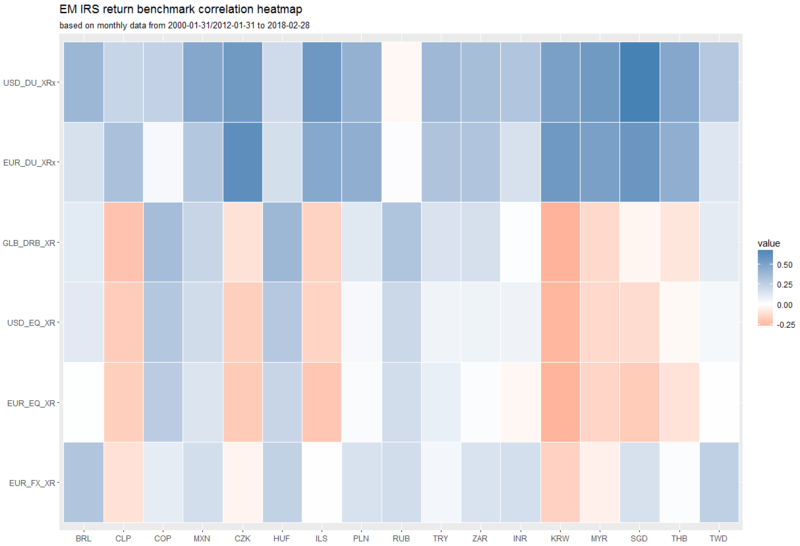 Monthly benchmark correlations of EM IRS returns have been more diverse. 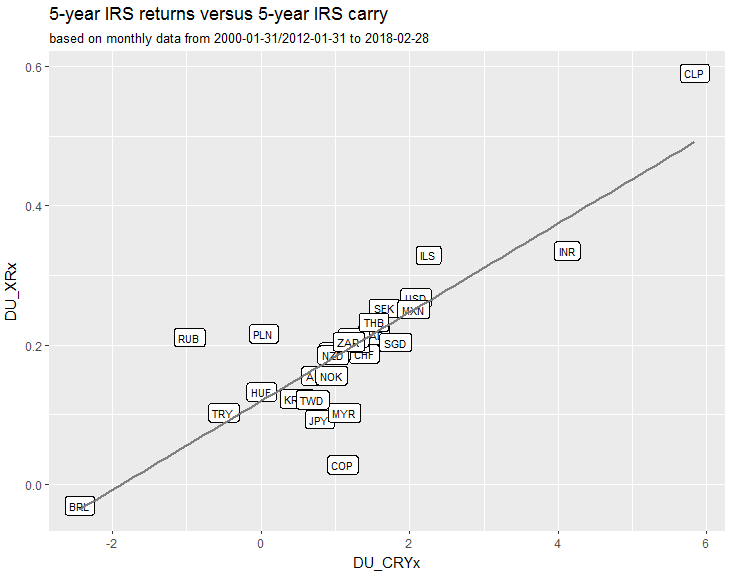 IRS returns for all currencies excluding TRY have been positively correlated with USD and EUR IRS returns. 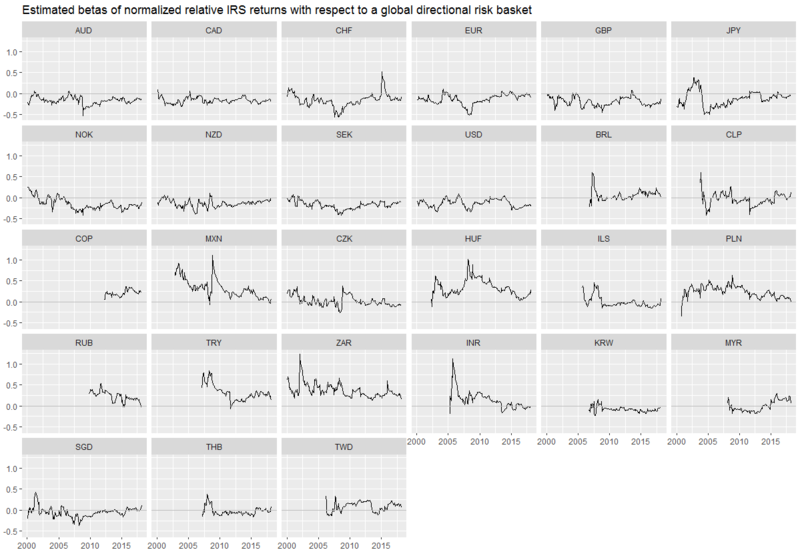 However, correlation with a global directional risk basket and G2 equity has been diverse. Several currencies, such as CLP, CZK, ILS, KRW and MYR posted negative risk correlation, similar to developed swap markets. Others, such as COP, MXN, HUF, RUB, TRY and ZAR posted positive risk correlation. Conditions for positive risk correlation seem to be FX carry and elevated local credit risk. The heavy-tailedness of IRS returns argues for consideration of volatility targeting in discretionary trading and algorithmic strategies. Volatility targeting means scaling notional positions based on recent return variation such that the expected volatility of the PnL of the position accords with a target. The aim is to keep the actual volatility of positions close to that target. We have simulated a simple and practical version of such volatility targeting based on the following parameters:  the targeted annualized standard deviation of IRS receiver positions has been set to 10%,  the basis for position adjustment has been a historic exponential moving averages of returns with a half-time of 11 days, and  positions are rebalanced once a month at the beginning of the month. 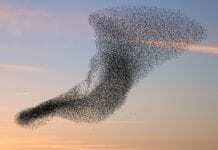 The purpose of the analysis is to see whether such a simple procedure would have reduced outliers. 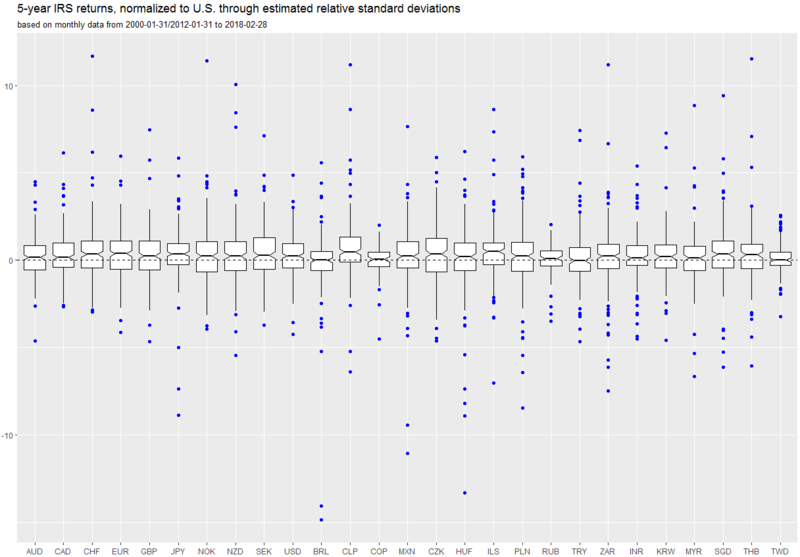 In developed markets, estimated annualized standard deviations have varied overtime. The range of the global average standard deviation from 2000-2018 has been between 1.5% and 5.2%. 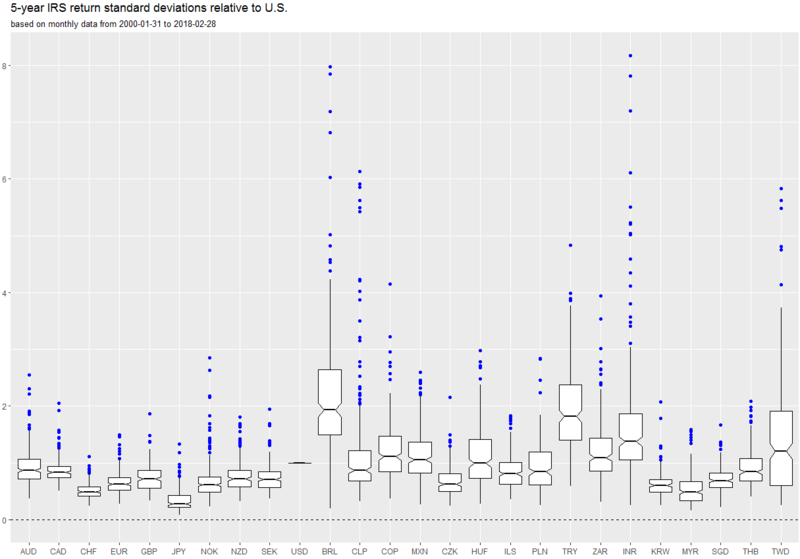 Across countries the highest annualized standard deviation has been recorded in USD (3.5%), the lowest in JPY (close to 1%). In extreme cases estimated annualized standard deviation rose above 30%. On balance active volatility-targeting with monthly rebalancing has failed to contain fat tails. 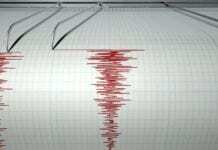 In fact, it increased them, with the excess kurtosis coefficient rising to 2.9 from 2.4. The boxplot below compares returns on position with average 10% ASD (light blue) and those that actively adjust position sizes (dark blue) to accomplish the target. The active adjustment produces larger outliers for most countries, particularly in BRL, CHF, JPY, MXN and TRY. Given the dominance of communal global factors across IRS markets, relative IRS positions, for example in one market against a global average, may be better suited for setting up more idiosyncratic and diversified trades. For relative positions across IRS markets one needs to adjust for relative standard deviation. These estimates may be more stable and reliable than those of absolute standard deviations since one does not need to predict communal global market shocks. Here we estimate relative volatility as a ratio of the standard deviation of the local-currency IRS receiver returns to the standard deviation of the USD IRS receiver returns, based on an exponential lookback window with 11 day half time. Empirically there have been significant and persistent differences in relative standard deviations across markets. Indeed, the normal ranges of standard deviation estimates for some currency pairs never overlap. Relative normalization makes the distribution of duration returns more comparable across countries in term of total and normal variations, as illustrated by the below box-whisker charts. The ratio of standard deviation in the most volatile market relative to the least volatile market has been 2.9, still sizeable, but down from 4.5 without relative normalization. There are two limitations for setting up relative positions based on relative estimated standard deviations. Relative normalized returns have a lot fatter tails than outright or relative non-normalized returns, presumably as consequence of the occasional failure of relative standard deviation estimates to predict the future, which can lead to large ex-post relative returns in times of turbulence. The other limitation of relative positioning based on relative standard deviations in the IRS space is that they do not remove the directionality of the trade in respect to risk. In some cases it increases directionality. This reflects that the payer and receiver countries of the relative trade may have very different risk properties. Due to the apparent differences in risk directionality of IRS receivers, hedging through a global directional risk basket should be be considered. In this section the market risk is approximated by a cross-asset basket, consisting of 1/3 global equity index futures, 1/3 credit default swaps and 1/3 carry and EM currencies. Hedge ratios are estimated as ‘betas’ of 1-month FX forward returns with respect to that basket. Hedge ratios are re-estimated once per month at the beginning of a month and applied to trading positions for the subsequent month. Hedge ratios are estimated as beta to the relevant benchmark, through weighted least-squares regressions based on rolling windows of daily and weekly data. In these regressions past observations carry exponentially decreasing weights backward in time. 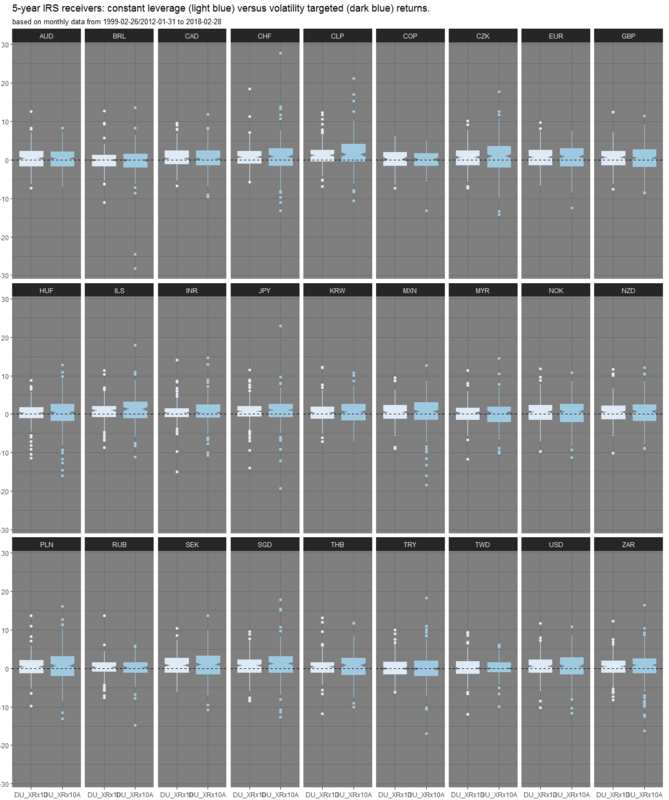 While daily data provide more observations, they also often understate the correlation due to time zone effects, i.e. 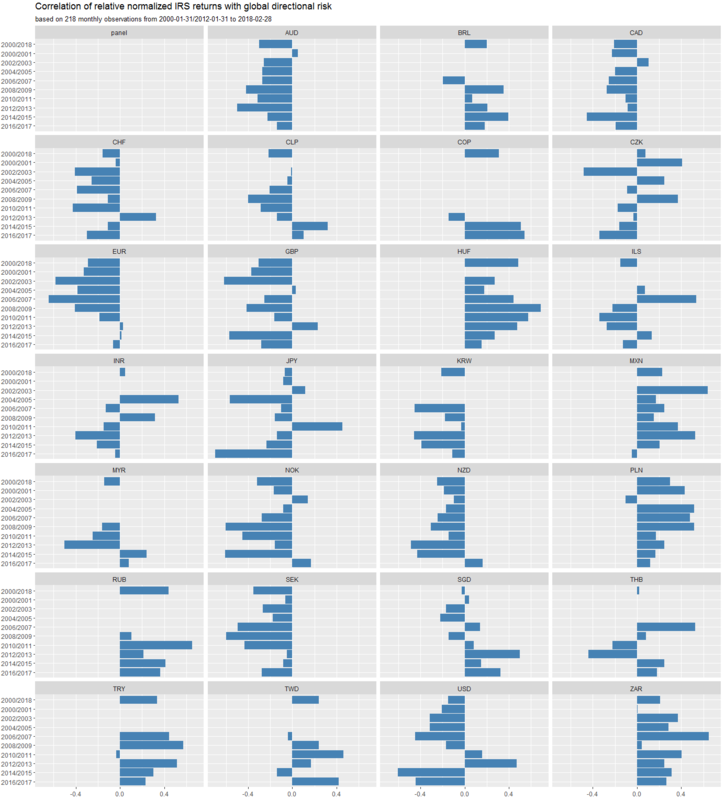 incomplete overlap of trading hours during the day. 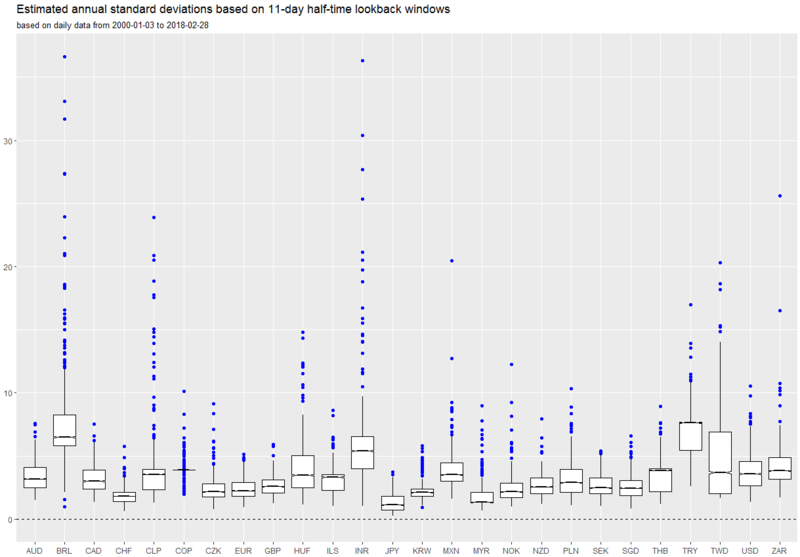 Therefore we us a weighted average of weekly-data estimate (26 weeks half time of lookback window) and a daily-data estimate (63 days half time of lookback window). This has been set a-priori based on expert judgment without any attempt of statistical optimization. 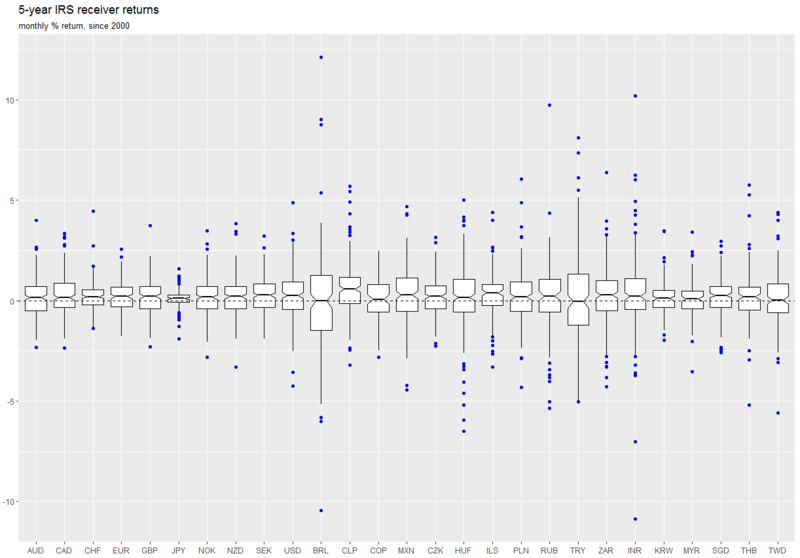 Estimated betas of normalized IRS returns have been quite variable overtime, with pronounced seasons. This dovetails theoretical considerations that suggest that correlation between global risk and duration returns depends on the underlying economic shock: inflationary or monetary policy shocks cause positive correlations, while growth and financial system shocks cause negative correlation. For developed markets, risk betas have mostly been negative. For EM, betas have been mixed, with prevalence of positive values for high-yield countries. Estimated betas of relative normalized returns are broadly similar in pattern, but a little more stable and homogeneous across countries. Hedging has broadly been successful. The average out-of-sample 3-month absolute correlation coefficient – measured as correlation of daily returns with 3-month lookback – between IRS and GDRB returns decreases from 0.23 to 0.12 as consequence on the hedging. The standard deviation of the hedged returns is not lower, however. The reduction of correlation of the relative returns has been similar, from 0.25 to 0.13.